Writing a funeral sermon or planning a funeral service is never easy. Death is never an easy subject to deal with especially if it relates to non-believers or young people. After many years of writing funeral sermons and preparing funeral services, I have accrued numerous resources that have helped me put together sermons and services that are sensitive and well received. There are no secret formulas for writing funeral sermons or planning funeral services. However, seeing how other people write funeral sermons and plan funeral services is very helpful. You are unique and these unique distinctives often shape your presentation and how you perform official duties at the funeral service. Therefore, it's a case of compiling resources that will assist you in preparing and presenting funeral sermons that are conducive to your personality and style. 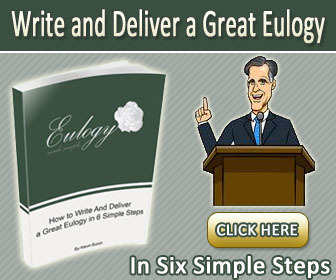 I have provided several resources that may be helpful to you as you write funeral sermons and plan funeral services. When I write a funeral sermon and plan a funeral service, I usually weave a message throughout the whole service. The following two free funeral sermons follow this format. I have written one sermon for a Christian funeral and I have written the other sermon for a non-Christian funeral. The Christian funeral sermon is a celebration of life. I wrote this message for a Christian who wanted the people who attended the funeral service to know that he was a Christian. He also wanted them to know that death was not the end and that he was now in heaven. This Christian asked me to focus the sermon on heaven. He wanted to challenge the people at the service to think about their eternal destiny. The non-Christian sermon had a different focus. I wrote this message with a focus on her journey through life.The family insisted that I present a message around their mother's favourite poem. I accepted their request. I discovered latter that their mother's favourite poem had a Christian message. . This gave me an opportunity to present a gospel message in a senitive way that was well received. 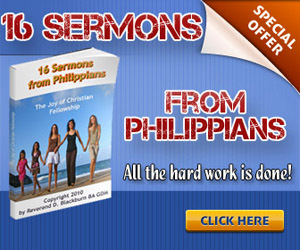 You can download these two free funeral sermons by clicking on the following link - Free Funeral Sermons. We are all different when it comes to writing and presenting information. Our style and personality play a big role in how we write messages and how we present them in a public setting. To take a funeral message from a book and preach it at a funeral service requires work. I received several resources from my professors while at seminary. Those resources helped me in ministry, especially the funeral sermon outlines and messages. I did not use any of those messages outright. However, I was able glean ideas from those messages. Those ideas helped me put together several funeral sermons that reflected my style and personality and the way that I uniquely presented messages. The material provided in Funeral Sermon Outlines is another resource for ministers to glean for ideas for funeral messages and funeral services. 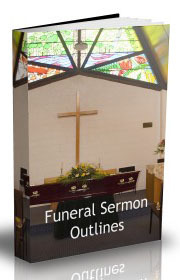 You will find in this product funeral sermon outlines, funeral notes and how to plan funeral services. 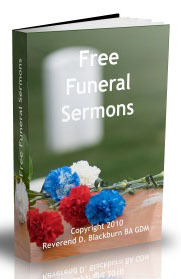 It is another resource for building your repertoire of funeral sermons. Funeral services are usually reflective in nature; and therefore, they have several segments in which people can give a tribute, eulogy, reading or message. How you present these segments will help family and mourners say goodbye to their loved ones and in turn begin the healing process. It is vital to help people express their grief and feelings. 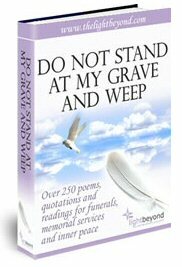 The collection of funeral memorial poems, quotations and readings in Do Not Stand At My Grave and Weep are very helpful in planning for funeral and memorial services. Sometimes a poem, quotation or reading can express exactly what we want to say to the grieving family. An appropriate poem can help us say goodbye. A reading or a quotation can give us a glimpse into the life of the deceased person and this often helps in the grieving and moving on process. "When a loved one is being mourned, we often turn to poetry in order to express our deepest thoughts and feelings. The right poem, whether ancient or modern, will help us clebrate a life that has ended and, perhaps allow us to find some comfort" (Quote by Julia Watson). When you purchase this product, you will also receive Bereavement For Beginners,. This resource is for those working with people going through the grieving process. This material will help you to help others work through the ups and downs of losing a loved one.